Enough for two! A fresh, whole onion cut to bloom, hand-battered, and served with our special seasoned sauce. Choose your temperature: mild, hot, or Texas hot. One pound of meaty wings. Strips of golden fried chicken breast served over steak fries with a tangy honey mustard dressing. Regular or Buffalo style. Steak fries smothered with melted Monterey Jack and Cheddar Cheeses, topped with bacon, and served with Texas ranch dressing. Succulent Shrimp and cherry peppers tossed in a spicy garlic sauce. Crispy potato halves loaded with Monterey Jack and Cheddar cheeses, and topped with bacon. Served with sour cream and chives. A generous portion of melted cheeses with diced tomatoes. 6 oz. sirloin, barbecued chicken breast smothered in Monterey Jack, Cheddar cheese, mushrooms and 3 crispy fried shrimp. Our 6-oz sirloin with a 1/2-pound of King Crab Legs. 9-oz. grilled beef medallions, 5 grilled shrimp, and garlic mashed potatoes. 9 oz. center-cut sirloin and 5 jumbo fried shrimp. Apple Cobbler topped with Ice Cream. Strips of grilled sirloin on a bed of the garden's best greens, tossed with Chipotle Bleu cheese dressing and topped with red onions, Bleu cheese crumbles, tomatoes and crispy tortilla strips. A cool, crisp wedge of iceberg lettuce smothered in rich, creamy Bleu cheese and tomatoes. Fresh grilled chicken, the garden's best greens, diced egg, bacon, tomatoes, Cheddar cheese, and avocado. Dinner salad and a bowl of soup. Tender grilled strips of chicken breast on a bed of crisp romaine, tossed with Caesar dressing, Parmesan cheese, and croutons. A scrumptious vanilla smoothie blended with Hershey's chocolate syrup and Oreo crumbles. Slip away into a strawberry smoothie blended with Pina Colada. Two kids eat free off Kids' Menu with the purchase of any entrée. Saturday 11 a.m. - 4 p.m., Tuesday All Day! The name says it all - fresh ground chuck toped with melted Swiss cheese and covered with our sautéed mushrooms. Basted with BBQ sauce, topped with melted Cheddar cheese and stacked with crispy onion strings. All by its lonesome. Great taste perfectly grilled. A sizzling 7 oz. Delmonico steak served on a golden toasted sesame seed bun. Boneless barbecued chicken breast, topped with Cheddar cheese and bacon. A huge 14 oz. hand-cut ribeye, marinated in Cajun spices and mesquite-grilled to your specifications. Our most flavorful steak, always tender and juicy. One of our most popular steaks. Specially selected for the Texas-sized appetite - two steaks in one. Fresh juicy ground steak smothered with sautéed onions or sautéed mushrooms. 8 oz. of tender filet mignon medallions served over Texas rice and steamed vegetables. Fresh salmon filet, marinated in sweet bourbon, then grilled with mesquite wood. Two lightly seasoned, grilled cold water lobster tails with choice of soup or dinner salad. 15 crispy fried shrimp served with cocktail sauce. 10 plump, succulent shrimp grilled and basted with our own seasonings, then served on Texas rice. One pound of fresh-from-the-sea crab legs. Fresh mixed greens with Cheddar cheese, red onions, tomatoes, croutons, and your choice of dressing. The garden's best greens, Cheddar cheese, red onions, tomatoes, and mushrooms with bacon, croutons, and the dressing of your choice. The garden's best greens, Cheddar cheese, red onions, tomatoes, and mushrooms with bacon, croutons, and the dressing of your choice and topped with our Sweet Bourbon Salmon. The garden's best greens, Cheddar cheese, red onions, tomatoes, and mushrooms with bacon, croutons, and the dressing of your choice topped with strips Sirloin grilled to perfection. The garden's best greens, Cheddar cheese, red onions, tomatoes, and mushrooms with bacon, croutons, and the dressing of your choice topped with Mesquite-Grilled Shrimp. A cool, crisp wedge of iceberg lettuce smothered in rich, creamy bleu cheese, and tomatoes. Strips of grilled sirloin on a bed of the garden's best greens, tossed with chipotle bleu cheese dressing and topped with red onions, bleu cheese crumbles, tomatoes, and crispy tortilla strips. Fresh grilled chicken, the garden's best greens, diced egg, bacon, tomoatoes, Cheddar cheese, and avocado. The garden's best greens, Cheddar cheese, red onions, tomatoes, and mushrooms with bacon, croutons, and the dressing of your choice topped with strips of grilled chicken breast. Succulent shrimp grilled and basted with our own seasonings. Lightly seasoned, grilled cold water lobster. With a hint of jalapeno and topped with Jack cheese. Served with tortilla chips. Golden fried with a tangy honey-mustard dressing, served over steak fries. Crunchy fries smothered in gooey Monterey Jack and Cheddar cheeses, topped with bacon, and served with ranch dressing. Enough for two! A fresh whole onion cut to bloom, hand-battered, and served with our special seasoned sauce. A generous porion of melted cheeses with diced tomatoes. A boneless chicken breast grilled to juicy perfection, available barbecued or Cajun. Fresh salmon filet, marinated in sweet bourbon, then grilled over mesquite wood. A boneless chicken breast barbecured to perfection, topped with Cheddar cheese, diced tomatoes and chives! Add bacon for 50 cents. Served with tangy honey mustard dressing. A tender, grilled, 8 oz. center-cut bone-in chop available barbecued or Cajun. Strips of golden fried chicken breast with a tangy honey-mustard dressing. Regular or Buffalo Style. Fresh, juicy ground steak smothered with sautéed onions & sautéed mushrooms. Mesquite-grilled and basted in our secret seasoning. The name says it all -fresh ground chuck topped with melted Swiss cheese topped with our sautéed mushrooms. Monterey Jack cheese and bacon. Generously seasoned with our famous Cajun spices. All by its lonesome. Great taste and perfectly grilled. Smothered in American, Cheddar, Swiss or Monterey Jack. Cheddar cheese, BBQ sauce, and bacon. Seasoned with black pepper, smothered with melting bleu cheese crumbles, and topped with bacon. Basted with BBQ Sauce, Cheddar cheese and stacked with crispy onion strings. American, Cheddar, Swiss or Montery Jack. A classic Manhattan with a southern flair featuring Maker's Mark Bourbon and Martini & Rossi Sweet Vermouth, served on the rocks. A true Lone Star favorite made with Major Peters' "The Works" Bloody Mary Mix and your choice of vodka or gin. The classic Harvey Wallbanger featuring SKYY Vodka, fresh orange juice, Galliano and a touch of grenadine; a taste as soothing as a sunset over the mountains of El Paso! Beefeater Gin with a splash of club soda served chilled over ice for the perfect Tom Collins cocktail. A first class sidecar with Remy VSOP Cognac, Cointreau Orange Liqueur and a touch of lemon juice, served straight up and ice cold. SKYY Vodka and Ocean Spray Cranberry Juice Cocktail served on the rocks is the perfect southern version of the great Cape Cod. A classic mix of J&B Scotch and Drambuie. Kahlua Coffee Liqueur, Bailey's Irish Cream and Frangelico Italian Liqueur with fresh coffee will leave you floating in the clouds! Fall in love with the delicious taste of Remy Martin VSOP and Disaronno Amaretto added to coffee. Irish eyes are smiling on this cozy pair... Jameson Irish Whiskey and Baileys Irish Cream with hot coffee. A delicious treat of Chambord Black Raspberry Liqueur and Kahlua Coffee Liqueur with fresh coffee. A cozy blend of Captain Morgan Original Spiced Rum and DeKuyper Creme de Banana with coffee. Grand Marnier and Kahlua added to a fresh, hot cup of Joe. Our signature frozen delight - a delectable mix of rum, Dekuyper Peachtree Schnapps, Freixenet Champagne and fresh peach flavoring. The classic strawberry daiquiri featuring Bacardi Rum, a favorite at the Kerrville Music Festival. A Georgia favorite! Our classic Bacardi Rum daiquiri with DeKuyper Peachtree Schnapps. Bacardi Rum, DeKuyper Pucker Sour Apple Schnapps and lime make this daiquiri a must-have! This island favorite made with Captain Morgan Original Spiced Rum is so good you can feel the tropical breeze! A new twist on a tropical favorite made with Captain Morgan's Parrot Bay Rum and Kahlua Coffee Liqueur. A buckin' bronco blend of Myers's Dark Rum, KeKuyper Blackberry Brandy, DeKuyper Creme de Banana, and grenadine, topped with a floater of Myers's Rum. Our specialty! A 21oz. frosty Margarita made with Jose Cuervo Gold Tequila and a blend of secret mixes. Shake it up with Margaritaville Tequila Oro and Cointreau Orange Liqueur, served on the rocks. Sauza Hornitos 100% Blue Agave Tequila and DeKuyper Blue Curacao blended and served frozen or over ice is sure to make you howl! Jose Cuervo Gold Tequila, Grand Marnier and Cointreau Orange Liqueur served frozen or on the rocks...It's the top shelf all the way! A delicious Margarita featuring Jose Cuervo Gold Tequila and Chambord Black Rasberry Liqueur, served frozen or on the rocks. Jose Cuervo Gold Tequila blended with a touch of strawberry for a refreshing Magarita. A must-have blend of Absolut Vodka, Midori Melon Liqueur and orange juice. A delicious shot made with SKYY Vodka, DeKuyper Triple sec, DeKuyper Blue Curacao and Rose's Lime Juice. A lip smaking concoction of Baileys Irish Cream and DeKuyper ButterShots Schnapps. Chambord Black Raspberry Liqueur and Smirnoff Vodka will make you hoot and holler! DeKuyper Peachtree Schnapps, Midori Melon Liqueur, Disaronno Amaretto, Ocean Spray Cranberry Juice Cocktail and orange juice... sand not included! Absolut Vodka, Frangelico Italian Liqueur and Baileys Irish Cream will bring out a southern drawl. It's the bomb! Kahlua Coffee Liqueur, Baileys Irish Cream and Grand Marnier hit the spot. Remy Red Liqueur, Smirnoff Vodka, Captain Morgan Original Spiced Rum, pineapple juice and orange juice with a touch of grenadine make this a powerful and delicious cocktail. Absolut Vodka, Kahlua Coffee Liqueur and cream served over ice for a touch of class. A smooth blend of Remy Red Liqueur and SKYY Vodka served over ice to give you the taste of a refreshing tropical punch. Jack Daniel's, DeKuyper Triple Sec and a splash of 7-Up will have you dreamin' of front porch swings! This timeless blend of Tanqueray Gin, Smirnoff Vodka, Bacardi Limon Rum, DeKuyper Triple Sec and cola makes for a smooth ride along Route 66. Absolut Vodka and Chambord Black Raspberry Liqueur served straight up and ice cold with a lemon twist. Tanqueray Gin served up with a lemon twist or two olives. Solichnaya Vodka, Martini & Rossi Dry Vermouth and olive juice. SKYY Vodka and Kahlua Coffee Liqueur create a perfectly elegant martini. A one of a kind Margarita-style martini featuring Sauza Conmemorativo Tequila and Cointreau Orange Liqueur vigorously shaken and served straight up. This delightful mix of Remy Red Liqueur, Bacardi Limon Rum and lime is a must-try! Southern Comfort & Disaronno Amaretto make this drink a real slammer. Try it up or on the rocks. The Majestic Steakhouse restaurant in Kansas City, Missouri brings out all of the flavor that you are looking for in a Kansas City environment. Kansas City's best steaks complimented by some of Kansas City's best live jazz entertainment makes for a special night indeed. Located just south of the Missouri river in downtown Kansas City, The Majestic Steakhouse delivers a one-two punch of great food and great live music. An opportunity to hear a "unique American art form" was our goal. Kansas City is renowned for its style of jazz, heard in a large number of different venues in the city. One of our friends told us about the Majestic Steakhouse, so my wife and I decided to spend an evening there. The Majestic is located at 10th and Broadway in the Historic Fitzpatrick Saloon Building in downtown Kansas City. The old Fitzpatric Building was originally a saloon and bordello built in 1911. During the liquor Prohibition of the 1930's, the basement was used as a speakeasy and a meeting place for many of Kansas City's business and political leaders. The building was renovated in the mid- 1980s to its former grandeur and is listed on the National Register of Historic Places. Now it is one of the nicest steakhouses in the city. My wife and I were surprised that we could not see or hear the jazz ensemble that we anticipated during our meal. Instead, we were serenaded by a solo acoustic guitar. The menu allowed us the opportunity to eat either pasta or steaks. We were regaled by the waiter and were very impressed by the service and the food. The prices, though, were steeper than many of the similar restaurants at which we often dine, ranging up to $35 (USD) for a steak. Still we enjoyed our evening. We were directed to the basement of the building to listen to the jazz music that was being played. A group called the Bram Wijnands Trio was playing there. We were able to spend the rest of the evening listening to the excellent music and enjoying a choice of beers and mixed drinks. The experience at The Majestic Steakhouse was superb. We were surprised by the prices at the restaurant, but the meal was delicious and we were well attended to by the staff. However, the time spent in the basement, where the jazz is played on a nightly basis, was worth the experience. All true jazz fans should give the Majestic a try. Kansas City Strip Sirloin . .
Roasted Prime Rib . . .Carved to order and served “au Jus” with horseradish sauce. “Personalize”your Steak! Sauteed Mushrooms $3, Grilled Onions $3, Twice Baked Potato $3, Garlic Rub $2, Bordelaise, Bearnaise or Brandy Peppercorn Cream Sauce $3. WAY OUT WEST, WHERE THE SPIRIT RUNS FREE... and the big sky meets the wide open spaces of the plains, the American tradition of great steaks served with warmth and friendliness was born. Today that commitment to delicious, quality steaks served with authentic hospitality is getting harder to find. But there’s one place you can still go to enjoy it. LongHorn Steakhouse. We’ve taken the best of the West and created a place where you can relax and unwind in a comfortable, inviting atmosphere. 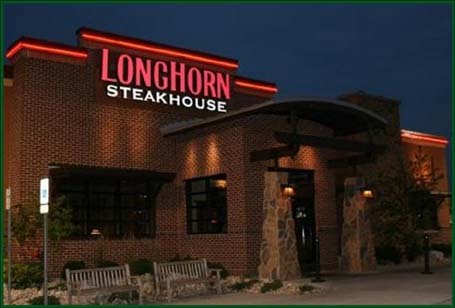 At LongHorn, we use only the finest quality beef, chicken, pork and seafood and grill each item to order. The burgers are thick and juicy, the salads freshly made. It’s a recipe for freshness that our guests have come to depend on. So whether your taste runs from tender, juicy steaks to mouthwatering chicken to BBQ ribs that fall off the bone, we have delicious choices that fit every appetite at LongHorn Steakhouse. A generous portion of batter-fried popcorn shrimp tossed with sliced cherry peppers, garlic butter and Prairie Dust™. Served with ranch dipping sauce. Crispy fried flour tortillas filled with spicy grilled chicken. Served with cool avocado-lime dipping sauce. Seasoned French fries smothered with our Authentic Texas Chili, three melted cheeses, hickory-smoked bacon and jalapeño slices. Jumbo Spanish onion petals, lightly battered, fried and sprinkled with Prairie Dust™. Served with a tangy dipping sauce. Over a half pound of lightly-battered, fresh chicken breast pieces tossed in our spicy chipotle buffalo sauce. Served with celery sticks and our bleu cheese dipping sauce. Delicious all-meat chili, freshly made with tomatoes, bell peppers and onions. Topped with cheddar cheese and jalapeño slices. Cup or Bowl. A delicious blend of shrimp and lobster baked in creamy white wine cheese sauce mixed with sun-dried tomoatoes. Served with tri-colored tortilla chips for dipping. Ask about today's special soup, served fresh and hot. Cup or Bowl. Two flavorful chicken breasts grilled, seasoned and basted with our own BBQ sauce, topped with three cheeses, hickory-smoked bacon and diced tomatoes. Served with seasoned French fries and your choice of one side dish. Twin grilled chicken breasts topped with sautéed shrimp, onions, mushrooms, sweet red pepper strips, melted Pepper Jack cheese and a spicy Cajun cream sauce. Served with choice of one side dish. Plump, juicy chicken tenders, hand-breaded and fried. Served with honey mustard sauce, seasoned French fries and your choice of one side dish. Two seasoned, grilled chicken breasts topped with a fresh, tomato-basil salsa. A lighter choice that's full of flavor. Served with rice and fresh seasonal vegetables. Add a Mixed Green or Caesar salad to your chicken dinner. Hand-seasoned and cooked to perfection, our signature Flo's Filet is treasured for its tenderness and savory taste. 7 oz. or 9 oz. Also available wrapped in hickory-smoked, peppered bacon. Our tender 9 oz. Flo's Filet is rubbed in pepper seasoning then grilled to perfection. Topped with fresh portabella mushrooms sautéed in a red wine glaze. A tender 9 oz. Flo's Filet cooked the way you like and topped with melted bleu cheese. Served atop a bed of red-wine glazed portabella mushrooms. Our 11 oz. USDA Choice Strip topped with sautéed balsamic onions in a Red Diamond Merlot and herb-shallot butter glaze. A favorite! Tender, juicy and flavorful, cut fresh from the rib loin. 12 oz. or 16 oz. Our specialty. A giant USDA Choice porterhouse with a New York strip and a large filet in one thick, delicious cut. Chargrilled over an open flame. 20 oz. The steak lover’s choice. Sink your teeth into hearty flavor and robust taste. 11 oz. or 14 oz. Hearty, USDA Choice top sirloin, seasoned with Prairie Dust™. 8 oz. or 12 oz. Slow-roasted USDA Choice fully-trimmed prime rib served one of three ways: Classic with au jus on the side, topped with red wine mushroom Bordelaise sauce or Spicy Western-Style chargrilled over an open flame. 12 oz. or 16 oz. A 7 oz. Flo's Filet paired with a generous portion of jumbo lump crabmeat baked in a creamy, rich cheese sauce with mushrooms and sweet peppers. Served with a side dish and a salad. A hearty New York strip and a tender filet in one cut. Chargrilled over an open flame. 16 oz. Zesty grilled shrimp and Flo's Filet. Served with rice and chipotle ranch sauce. Legendary Steaks and Prime Rib are served with your choice of one side item (unless one is specified), a Mixed Green or Caesar salad and hearth-baked bread. Freshly ground, seasoned, grilled and smothered with sautéed mushrooms, red wine Bordelaise sauce and crisp onion straws. A salmon fillet flown in fresh, hand-cut and prepared LongHorn style using our secret bourbon marinade. Served with rice, your choice of one side item and a salad. 7 oz. or 10 oz. A dozen skewered grilled shrimp seasoned with zesty spices. Served on a bed of rice with your choice of one side item and chipotle ranch sauce for dipping. A generous portion of jumbo shrimp, hand-breaded and fried golden brown. Served with seasoned French fries and jalapeño cole slaw. Our tender filet with our flown in fresh, bourbon-marinated grilled salmon. Served with rice, your choice of side dish and a crisp salad. Two cold-water lobster tails expertly seasoned and roasted to perfection. Served with melted butter, a side dish and a salad. Add a Mixed Green or Caesar salad. Fall-off-the-bone tender baby back ribs. Rubbed with our special seasonings, chargrilled for extra flavor and brushed with our own BBQ sauce. Served with jalapeño cole slaw and your choice of one side dish. Half Rack or Full Rack. Two 8 oz. center-cut, bone-in pork chops grilled and seasoned with Prairie Dust™. Served with seasoned French fries and your choice of one side dish. Juicy, tender steak rubbed with a special 7-pepper blend and grilled just the way you like it. Served over mixed field greens with diced roma tomatoes and bleu cheese crumbles. Crisp romaine tossed in balsamic vinaigrette. Topped with sliced, grilled chicken breast, fresh tomato-basil salsa, shaved red onion, pepperoncini peppers, shredded provolone and feta cheese. A juicy, sizzling half-pound burger topped with your choice of American, Swiss or cheddar cheese. Served on a grilled sesame seed bun with ketchup, mustard, mayo, shredded lettuce, tomato, pickle, onion and seasoned French fries. Add hickory-smoked bacon for only 50¢. A grilled, seasoned chicken breast topped with hickory-smoked bacon, melted Swiss cheese and honey mustard sauce on a grilled sesame seed bun. Served with seasoned French fries. Bourbon-marinated LongHorn Salmon is flown in fresh and served warm on a bed of mixed field greens and crisp romaine or Caesar salad. Mixed field greens and romaine topped with fried chicken tenders, red onion, mandarin oranges, warm sweet cornbread croutons and spicy pecans. Served with bacon-honey mustard dressing. Ruth's Chris Steak House in Kansas City is located on the Country Club Plaza, the Midwest's premier shopping and dining district. Rich mahogany details and high ceilings accent our steakhouse dining rooms, a perfect companion to the ambiance of the historic Plaza. Our restaurant is located on the northwest end of the Country Club Plaza at the corner of 47th and Jefferson. 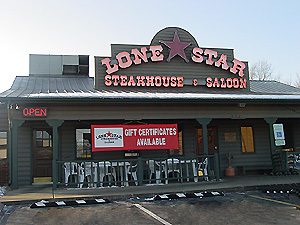 This is the place that showed the world how great a steak can be. Carefully selected and aged for tenderness. Cut thick to ensure juiciness. Seared to perfection at 1800 degrees. Seasoned simply with salt, black pepper and a touch of parsley, because a steak like this needs nothing else. Topped with fresh butter that sizzles seductively on your plate, announcing the arrival of a great steak. Our piéce de résistance, the Ruth's Chris Filet is the most tender, elegant steak available. Carved from the prized tenderloin, the Filet is the most popular steak on our menu. Our signature Filet is 12 ounces, and we also offer the smaller but equally tender 8-ounce Petite Filet. A tasty and tender steak, the Ribeye offers the great texture of fine steak. The Ribeye has the most marbling of any prime cut, and therefore it has superior tenderness and intense flavor. At Ruth's Chris, the Ribeye is always USDA Prime. We offer a 16-ounce Ribeye, as well as a 22-ounce bone-in Cowboy Ribeye. The New York Strip is a firm, well-marbled steak cut from the heart of the sirloin. Our 16-ounce New York Strip is packed with unbelievable flavor, so much so that many consider it our most flavorful cut of meat. Cut from the midsection of the short loin, the Ruth's Chris T-Bone is a classic cut of USDA Prime beef. The T-Bone combines two steaks in one - a flavorful New York Strip on one side of the "T" and a tender Filet on the other. Served on the bone for added flavor, the T-Bone offers the best of both steaks. We serve 24-ounce T-Bone steaks. A much larger version of the T-Bone, the Porterhouse at Ruth's is tasty enough to eat by yourself but is probably best shared by two. The Porterhouse got its name from old English pubs, where it was served alongside porter, ale and stout beers. Like the T-Bone, it combines the New York Strip and Filet, only on a much larger scale. The Porterhouse served at Ruth's Chris is a hefty 40 ounces. The best cuts of beef available. Broiled for an exact time at 1800 degrees Fahrenheit. A pinch of salt. A dash of ground black pepper. Fresh butter. A touch of parsley. That's all it takes to reach perfection. No need for exotic spices or heavy sauces. Just salt, pepper and whole butter. When a steak is this good, it needs nothing else. At Ruth's Chris, steaks are cut thick. We do this for two reasons: one, because a thick steak won't dry out during cooking and, two, because who wants a thin steak? All of our steaks are seared to perfection at 1800 degrees in a broiler designed exclusively for Ruth's Chris Steak House. What does "seared to perfection" mean? That's up to you. Ruth's Chris Kansas City Steakhouse "Sizzle"
At Ruth's Chris, sizzle is more than the mouthwatering sound that accompanies your steak from the broiler to the table. Here, sizzle is a state of mind, an attitude, a personality that could have only been born in New Orleans. As Ruth Fertel once said, "It's the sizzle that sets us apart from the stuffy, stodgy, old-line steak houses. You have a great steak at Ruth's Chris, but you also have a great time, and you always leave with great memories." Born in 1927 in New Orleans, Ruth Fertel had a passion for science. At age 19, she enrolled at Louisiana State University in Baton Rouge, where she majored in chemistry with a minor in physics. After college, Ruth taught briefly at McNeese Junior College in Lake Charles, Louisiana, but left to marry and start a family. Fourteen years later, Ruth divorced and reentered the workforce as a lab technician at Tulane Medical School in New Orleans. Four years later, convinced the position could not provide enough income to send her two sons to college, she decided to go into business for herself. In 1965, while scanning the classified section of the local newspaper, Ruth noticed an ad for a steak house for sale - Chris Steak House on Broad Street in New Orleans. Against the advice of her lawyer and her banker, she mortgaged her house for $22,000 and bought the restaurant, eventually renaming it Ruth's Chris Steak House. Ruth knew little about the restaurant business but, with a background in science, she became a great cook. What she lacked in experience, she made up for with hard work and natural hospitality. She only bought the best ingredients, confident that her guests would appreciate it. Soon, word spread of the fine steaks and quality service at Ruth's Chris Steak House, and it became a popular gathering spot for the city's political leaders, sports figures, media personalities and business people. In 1976, the original Ruth's Chris Steak House was destroyed in a fire. Faced with a disaster that would have overwhelmed many, Ruth responded with character and determination, purchasing a building just down Broad Street and reopening Ruth's Chris Steak House. Well aware of the restaurant's popularity, and convinced that the quality of its food and service could be duplicated, Ruth opened a second restaurant location in Metairie, a suburb of New Orleans, in 1977. That same year, at the urging of a loyal guest, T.J. Moran, she granted the first franchise for a Ruth's Chris Steak House, which opened in Baton Rouge. The staff at each Ruth's Chris Steak House knew Ruth; she was revered for her values of hard, honest work and a passion for quality and service. Ruth's Chris Steak House quickly became the largest fine-dining steak house company in the world and today has more than 80 locations worldwide. The enthusiasm and sheer determination of its founder made it a greater success than even Ruth had ever anticipated. Committed to industry and community programs, Ruth was the recipient of numerous awards, including the 2001 Ella Brennan Savoir Faire Award, the Restaurant Business High Performance Leadership Award, the DiRoNA Hall of Fame Award, Executive of the Year from Restaurants & Institutions Magazine, and the Horatio Alger Award. Throughout the years, until her death in 2002, Ruth was a popular fixture at the Broad Street restaurant. 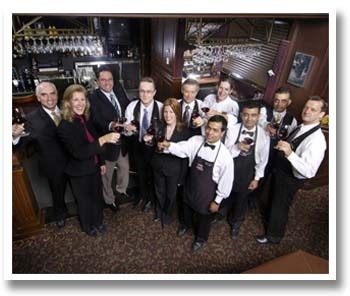 Today, Ruth's Chris Steak House continues to foster in its staff Ruth's legendary dedication to her guests. Ruth's Chris Steak House appears on "best restaurant" lists nationwide and has won countless awards and accolades from the industry and, more importantly, from its loyal guests. The members of the Ruth's Chris family are committed to upholding the vision of its founder: to treat others as we, ourselves, would want to be treated. In doing so, we honor Ruth's devotion to the industry, her genuine spirit, and her love for her work. At Ruth's Chris Steak House, the experience involves a lot more than nice décor and comfortable surroundings. From the moment you enter, you find you're treated like a friend. It was the way Ruth treated her guests, and that spirit of genuine hospitality was contagious. You'll find this atmosphere makes everything better, from the handshake with your favorite manager or server on the way in, to your favorite cocktail or wine, to the familiar sizzle that announces the arrival of your steak. Ruth's Chris Steak House is where you want to be. Jumbo Gulf shrimp dressed with your choice of our classic Creole remoulade sauce or our spicy New Orleans homestyle cocktail sauce. Saffron infused pasta filled with veal osso buco and fresh mozzarella cheese. Served with sautéed spinach and a white wine demi glace. Fresh crisp romaine tossed with Romano cheese, garlic croutons and creamy Caesar dressing. Topped with shaved Parmesan cheese and sprinkled with fresh ground pepper. A Ruth’s Chris original. Julienne iceberg lettuce, spinach and radicchio tossed with sliced red onions and mushrooms, chopped green olives, bacon, eggs, hearts of palm, croutons, Bleu Cheese and lemon basil dressing. Served with cherry tomatoes and topped with crispy fried onions. Fresh baby arugula tossed with sliced red onion, mushrooms and a warm bacon dressing. Topped with crisp bacon and chopped egg. A sliced Beefsteak tomato, basil and fresh buffalo mozzarella cheese with balsamic vinaigrette. A crisp wedge of iceberg lettuce on field greens topped with crumbled bleu cheese with your choice of dressing (a favorite is bleu cheese). Dressings are all made fresh, using our exclusive recipes. Two 4-ounce medallions of our filet topped with jumbo Gulf shrimp. Veal chop marinated overnight in a savory blend of pepper vinegar, garlic and onions. Broiled and served sizzling with hot and sweet peppers. Marinated Portobello mushrooms on our garlic mashed potatoes, with grilled asparagus, broccoli, tomatoes and sizzling lemon butter. Seared rare tuna topped with Colossal lump crabmeat and served sizzling with red pepper pesto. Granny Smith apples baked in a flaky pastry with streusel crust and vanilla bean ice cream. Lunch is served only at select locations. Sauteed in white wine, butter, garlic and spices. Topped with shaved Parmesan cheese and sprinkled with fresh ground pepper. Assorted lettuces with cherry tomatoes, garlic croutons and red onions. Grilled marinated chicken atop our Caesar Salad. Jumbo Gulf shrimp and jumbo lump crabmeat tossed with fresh lemon and olive oil served on a bed of mixed greens, tomatoes and diced peppers. Jumbo Gulf shrimp served with our signature Ruth's Chop Salad. Fresh field greens, red onions and crunchy vegetables tossed with vinaigrette and served with slices of our blackened Ahi tuna. Flat iron steak served atop assorted lettuces with mushrooms, bacon, egg, red onions, cherry tomatoes and croutons. An 8-ounce steak topped with our signature bleu cheese crust. An 8-ounce thick cut of the most tender corn-fed Midwestern beef. A 12-ounce USDA Prime cut. A 12-ounce USDA ribeye well marbled for extra flavor. Filet, marinated chicken breast and your choice of pork chop or Andouille sausage. Marinated 10-ounce veal chop served sizzling with sweet and hot peppers. Sliced flat iron steak with crispy onions and Béarnaise sauce served with our homemade Julienne fries. Grilled Prime hamburger with Swiss or Cheddar cheese served with our homemade Julienne fries. Ruth's Chris Steakhouse only uses the best ingredients, and that philosophy extends from the kitchen to the wine cellar to the bar. So enjoy a martini with your favorite vodka, whether that's Grey Goose, Armadale or Chopin. If you're a Scotch drinker, be sure to try the 25-year-old Macallan single malt. Of course, Ruth's Chris Steakhouse also has the finest vintages from the world's greatest wineries, by the bottle or by the glass. At Ruth's Chris, your meal will always have the perfect accompaniment. The wine cellar at Ruth's Chris is stocked with hundreds of the world's finest wines. The best cabernets from Napa Valley. The best Bordeaux from St. Estephe. The best Chianti from Tuscany. At Ruth's Chris, you can take your pick of the best. And with a prestigious vineyard that produces exclusively for Ruth's, you can have wines you'll get nowhere else. Ruth's Chris has a lot in common with the cocktail. Both were invented in New Orleans. So come to Ruth's for the perfect mix - whether it's a classic martini, a gin and tonic, a whiskey sour, or one of our signature cocktails. Appleton White Rum, Fresh Lime Juice, and Wild Berries muddled with simple syrup and a touch of mint. Bacardi White Rum, Fresh Mint and Sugar and Fresh lime juice. 10 Cane Rum, Fresh Basil, Strawberries, Simple Syrup, and a splash of Ginger Ale. Bacardi O, Triple Sec, Orange Juice, fresh Lime Juice and a splash of soda water. Ketel One Citroen, Chambord and a hit of lemon-lime soda with a sugared lemon wheel. Appleton White Rum, Fresh Lime Juice, Sugar and a splash of fresh Pink Grapefruit juice. White Peach puree, Brut Champagne and a splash of Peach Schnapps. Fresh Pomegranate and Lime Juices, Cointreau and Sauza Tres Generaciones. Grey Goose Orange, Crème De Banana and a combination of exotic fruit juices. Grey Goose Vodka, DeKuyper Pucker Sour Apple, Pineapple Juice, Midori, Garnished with a Granny Smith Apple Slice. Ketel One Citroen, Cointreau, Cranberry Juice, Garnished with Lime Wheel. Remy VS Cognac, Cointreau, Tuaca, Fresh Lemon Juice, Served in a Yellow Sugar-rimmed Glass. Ketel One Citroen, Pomegranate Juice, Fresh Lemon Juice, Served in a Yellow Sugar-rimmed Glass. Gentleman Jack, Sweet Vermouth, Southern Comfort, Garnished with a Maraschino Cherry. A true Kansas City Tradition, Hereford House restaurants have been offering visitors and Kansas Citians premier steak and customer service since 1957. Located at 20th and Main in the heart of Kansas City, Hereford House can accommodate an intimate dinner for two or a party of 200, and personalize a dinner date, business meeting, party or banquet. Join the local crowd for a real taste of Kansas City. This downtown location is the original Hereford House, but additional restaurants are located in Leawood, Ks., Independence, Mo., and Zona Rosa in Kansas City, Mo. In 2007, Hereford House celebrates its 50th anniversary. 50 years old and still in its prime. Reservations are recommended, never required. Casual attire is welcomed. For details on planning your next memorable Kansas City event, call our private dining coordinator at 816-842-1080. A true Kansas City tradition, Hereford House restaurants have been offering visitors and Kansas Citians premier steak and customer service since 1957. One of the fastest-growing areas in Kansas City is Independence, Mo., home to the fourth Hereford House restaurant. Adjacent to the new Hilton Garden Convention Center, this location offers seating for one to 150, with access to the Hilton's banquet room for 650. An award-winning wine list complements the premier steak, and the top-quality customer service is what Kansas Citians have learned to expect at the Hereford House for generations. Additional Hereford House restaurants are located in downtown Kansas City at 20th and Main, Leawood, Ks., and Zona Rosa in Kansas City, Mo. In 2007, Hereford House celebrates its 50th anniversary. 50 years old and still in its prime. Reservations are recommended, never required. Casual attire is welcomed. A true Kansas City tradition, Hereford House restaurants have been offering visitors and Kansas Citians premier steak and customer service since 1957. The first Hereford House restaurant outside the traditional location in downtown Kansas City, the Leawood location opened in 1997 during Hereford House's 40th year in business. The perfect choice for business lunches and or dinner dates, to wedding rehearsals and birthday bashes, our private dining rooms accommodate parties 20 to 100. Hereford House Leawood is a great way to experience a true taste of Kansas City. Additional Hereford House restaurants are located in downtown Kansas City at 20th and Main, Independence, Mo., and Zona Rosa in Kansas City, Mo. In 2007, Hereford House celebrates its 50th anniversary. 50 years old and still in its prime. The Leawood location celebrates its 10th anniversary in March, 2007. A true Kansas City tradition, Hereford House restaurants have been offering visitors and Kansas Citians premier steak and customer service since 1957. Located at Zona Rosa in Kansas City's vibrant Northland, this newest Hereford House location continues to carry the Hereford House tradition of serving exceptional food with exceptional customer service. Additional Hereford House restaurants are located in downtown Kansas City at 20th and Main, Leawood, Ks. and Independence, Mo. In 2007, Hereford House celebrates its 50th anniversary. 50 years old and still in its prime. KANSAS CITY, MO. – There was something special about 1957. John Lennon and Paul McCartney met for the first time. The Little Rock Nine defied segregation at Central High School in Little Rock, Ark. In Kansas City, two men with no experience operating a restaurant decided the time was right to open a steakhouse near the stockyards. Their dream became a Kansas City institution that endures to this day. On Oct. 1, 1957, Jack C. Webb and Joe Marlo opened Hereford House. In the 50 years since that day, the restaurant has served top-quality steaks with top-notch customer service. Located close to the famous Kansas City stockyards, the popularity of Hereford House was natural in a city considered the beef capital of the Midwest. The restaurant has acquired a loyal customer base from the Kansas City metro area and around the country. "Locals" from as far away as Sedalia, Mo., travel to dine on what many call America's finest steaks. Dinner at Hereford House is on the itineraries of Kansas City visitors. In fact, days before purchasing Hereford House in 1987, Anderson struck up a conversation with a fellow traveler in New York. Upon hearing of Anderson’s destination to Kansas City, the stranger recommended a “great steakhouse called Hereford House.” Twenty years later, Anderson recalls this moment fondly. The loyal staff at Hereford House also has become a tradition. Mary “Petey” Skivers was a floor manager at the downtown restaurant for more than 40 years. She – and her wicked sense of humor – remain Hereford House legend among customers and employees. “She was the most unusual and one of the most valued people who ever worked for me,” said Webb, Hereford House founder. When Anderson acquired Hereford House in November 1987, remodeling began immediately and expansion soon followed. Throughout the renovation, Anderson focused on maintaining the atmosphere and tradition of the beloved Kansas City restaurant. In March 1997, Anderson opened a second location in Town Center Plaza in Leawood, Kan. Enjoying the same success as its downtown sister, the Leawood restaurant celebrates its 10th anniversary this year. Anderson also opened other Hereford House locations in Independence, Mo., and Zona Rosa in Kansas City, Mo. Capitalizing on the Leawood location’s success, Anderson opened Pierpont’s two years later in the newly renovated Union Station in 1999. Dubbed "the culinary jewel" of Kansas City, Pierpont's today holds the reputation of serving the city’s finest steak and seafood selections. All sandwiches and steakburgers served with french fries. provolone cheese, caramelized onions, chipotle mayonnaise, served on focaccia bread . mayonnaise, served on toasted sourdough bread . Enjoy our 1/2 pound steakburger, hand pattied and ground fresh daily or a 6oz. boneless, skinless grilled chicken breast. Charbroiled over an open flame . Topped with bacon and your choice of cheese . Topped with grilled onions . Served with mashed potatoes and country gravy . Served with mashed potatoes and brown gravy . Served open face with mashed potatoes and brown gravy . Served with mashed potatoes and au jus . All entrees are served with house salad, Caesar salad or cup of soup and choice of side dish: baked potato, french fries, twice baked potato, mashed potatoes, mashed sweet potatoes, cheddar ranch potatoes or cut green beans. This house favorite starts with Devils food chocolate cake dredged with caramel, a layer of chocolate truffle mousse is added and glazed with a chocolate ganache, accented with almonds. Served on a bed of berry coulis then topped with a peach coulis. Haagen-Dazs vanilla ice cream, served with your choice of Ghiradelli Chocolate or Caramel sauce, topped with whipped cream and a cherry. A traditional carrot cake with a twist. Candied English walnuts accent this moist recipe with pineapple and coconut, layered with a white chocolate cream cheese filling. Topped with a brown sugar glaze and toasted candied walnuts. A New Orleans style recipe, made with Italian bread cooked in a white chocolate custard, accented with white chocolate ganache and drizzled in caramel sauce. Served warm. Raspberries, strawberries, blueberries and blackberries, served warm and topped with a strawberry scone and vanilla ice cream. Served on a pool of peach coulis and topped with berry coulis. Chef’s selection offered occasionally on the menu. July: Jack C. Webb and Joe Marlo take over the Kansas City Serveteria at 20th and Main in downtown Kansas City, Mo. Though Marlo had some experience running restaurants, Webb relied on a 35-cent, government-produced book titled “How to Operate a Restaurant” for advice. October: As the Kansas City Serveteria proves unsuccessful, Webb and Marlo decide to turn the space into a steakhouse. The Hereford House opens on Oct. 1, named after the American Hereford Association located near the restaurant. A Kansas City tradition is born. A devastating fire ravages the steakhouse. It takes more than a year to rebuild and reopen. Jack Webb sells Hereford House to the Simpson family. November: Rod Anderson acquires Hereford House. Expansion and remodeling began immediately as Rod strives to maintain the atmosphere and tradition of the beloved Kansas City restaurant. March: The Hereford House opens a second location in the prestigious Town Center Plaza in Leawood, Kan. The location enjoys the same success as its downtown sister. The Anderson Restaurant Group opens Pierpont’s in the newly renovated Union Station. Named for the railroad baron, J.P. (James Pierpont) Morgan, Pierpont’s 1914 décor combined with modern innovation offers guests an atmosphere of casual elegance and has been dubbed the “culinary jewel” of Kansas City. Another Hereford House location opens in Independence, Mo., one of the fastest-growing areas around Kansas City. Adjacent to the new Hilton Garden Convention Center, the Hereford House Independence offers seating for 150 and serves as a banquet arm for the new Hilton, with banquet seating up to 650. An award-winning wine list complements the premier steak, and the top-quality customer service is what Kansas Citians have learned to expect at the Hereford House for generations. December: The fourth Hereford House location opens in the new Zona Rosa shopping center. As the premier shopping, dining, entertainment and business destination in Kansas City’s booming Northland, this newest Hereford House location continues to carry the Hereford House tradition of serving exceptional food with exceptional customer service. July 2007: The Hereford House in Lawrence, Kansas has reopened as The HH Bar & Grill reflecting the lifestyle and energy of the city itself. October 2007: Coming Soon - Hereford House Shawnee! In November 1987, a partnership headed by Rod Anderson acquired the Hereford House. Expansion and remodeling began immediately, always striving to maintain the atmosphere and tradition of the restaurant Kansas City loved. 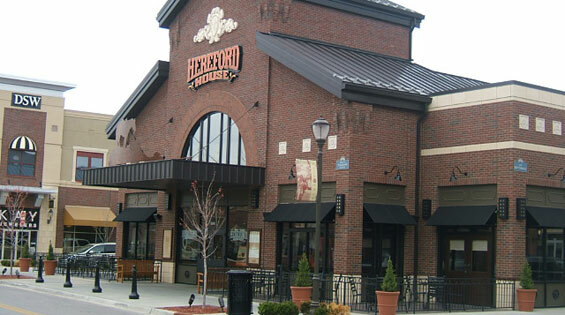 In March 1997, the Hereford House opened a second location in the prestigious Town Center Plaza in Leawood, Kansas. Since that time, the Hereford House has established a reputation as Leawood's first choice for great steaks. And of course, when you visit a fine hotel, you like to have the best steak in town for dinner. In October 2001, Hereford House Independence opened its doors, adjacent to the new Hilton Garden Inn and Hartman Conference Center. The Hereford House in Independence offers great large-group dining options. In December 2004, Hereford House opened yet another location in the Northland. Located in the heart of the Zona Rosa shopping center, the newest Hereford House is all that you'd expect from any Hereford House...simply the best steak you can buy...And we guarantee it! "I’ve dined at all the Hereford House locations and had meals catered at the Hilton in Independence. I’ve never been disappointed and would rate the experience is excellent. Service is always above average to excellent at all the Hereford Houses. 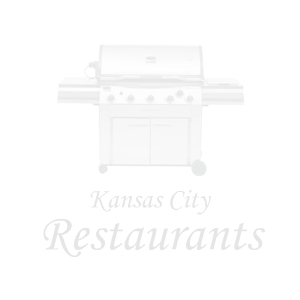 The service at Pierponts is excellent and would rate it as comparable to any restaurant in KC." "A great relaxed atmosphere, great beverages and food." "I think their service is excellent, and their staff is always very well trained. Their vegetarian offerings are always very tasty and filling. Their staff is a joy to work with, their prices are very reasonable, and their catering staff takes care of everything so I can focus on taking care of my part of the event. They'll be there on time and the food will be something you'll be very pleased to serve to your guests." "I’d say regardless of which venue or service you use, expect to deal with courteous, professional people and expect fresh quality food prepared right. I always get great service. Rod A is the quintessential restaurateur - it’s obvious he trains the staff well." "Hereford House (including Pierpont’s) is the best restaurant in Kansas City without question. The best in service - #1. The catered food does not appear catered - that is, catered food from the Hereford House is presented as if you were in the Restaurant itself. They are outstanding in every facet of food service. The Hereford House provides one of the finest, and yet most relaxed, dining experiences I have ever encountered. The food is excellent and the service is friendly and professional." "One of my top preferences for dining in Kansas City. One of my go-to restaurants when I am traveling in the Kansas City area." J. Gilbert's is an "upscale casual" steakhouse serving prime-aged beef cooked over a mesquite wood-fired grill. Guests enjoy various cuts of J. Gilbert's steak, fresh seafood (including award-winning crab cakes) & other house made favorites like the Maytag Bleu potato chips & Chocolate Velvet Cake. The cozy atmosphere at J. Gilbert's includes fire side dining, rich wood, brick & soft lighting where you can enjoy a quiet table or host a large party. The extensive martini & wine list at J. Gilbert's offers the perfect compliment to an excellent meal delivered with attentive service. J. Gilbert's is open for weekend lunch, dinner 7 days a week & Sunday Brunch. Reservations are recommended. The restaurant atmosphere at J. Gilbert's is top-notch, with lots of wood and a fireplace and relaxing but with class. We always enjoy spending a couple of hours at J. Gilbert's between the bar and our table; some nights we stay for hours and just absorb the atmosphere! The J. Gilbert's menu naturally features great steaks, but there are pasta, seafood, and chicken choices as well. 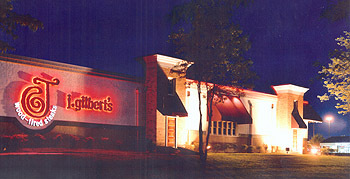 We have had several entrees at J. Gilbert's and they were all excellent. J. Gilbert's offers something for everyone. We always receive excellent service at J. Gilbert's and the manager always comes around personally to check on our dining experience. It seems like the management team at J. Gilbert's cares about staff and customers. If you're not careful your bill could be $100 for two (although you can keep it down to around $60 if you skip drinks and other options) so this is probably not a regular visit for most of us. But J. Gilbert's is a great restaurant for a special occasion.